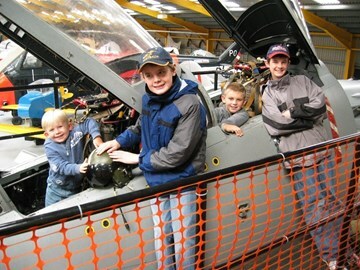 The museum relies on its volunteers to open aircraft cockpits and is unable to guarantee that cockpits like the Vulcan will be open every day. The cockpits tend to be open more frequently during special event days, details of which are always posted on the news page of the museum website, or via our Twitter feed; BUT WE CANNOT GURANTEE THIS! To avoid disappointment before travelling to the museum we suggest that you please call 01636 707170 to check what aircraft are likely to be open. Please remember that sometimes during the day that volunteers may need to temporarily close a cockpit to get something to eat or go to the toilet. Also during extreme weather conditions i.e. it is either is very hot, or it is very wet it may be decided to close the aircraft on safety grounds. Please remember that there is a small additional fee to access the aircraft. The monies raised from these aircraft admissions will be going towards the aircraft restoration and repainting work that we undertake, plus museum development. Due to the delicate nature of the leather seats in some aircraft like the Varsity and Shackleton we do not allow people to sit in the seats. Please respect this museum guidance and listen to the advice of our volunteer cockpit openers. We are also trialling the idea of tweeting details of what cockpits are open on particular days under the phrase #NAMopencockpits so why not follow us on Twitter via this web-link? Visitors are also reminded that the Beverley cockpit & Firefly CIM in Display Hangar 2 are available for a free unescorted look round every day. Recently, working in conjunction with its volunteer cockpit openers the museum reviewed its Cockpit Opening Policy. Having looked at some of the issues of access to a couple of aircraft on site it has been decided to apply a height restriction for access to aircraft like the Vulcan & Buccaneer. To that effect – Entry to certain aircraft is now dependent on height restrictions as displayed on site. This will initially apply to the Vulcan and Buccaneer aircraft with their steep access ladders and anyone wishing to pay the additional £1 per person fee to go inside these aircraft (when they are opened by the museum volunteers) will have to be at least 1.00m (one metre) in height. Furthermore the museum trustees would like to ensure that - Parents & Carers are reminded that they are responsible for the safety of children and young people in their care whilst on the museum site. It is hoped these arrangements will simplify questions of whether an individual is allowed to access the aircraft and it follows similar guidelines adopted at other venues around the UK. During some special event days the volunteers may operate a timed ticket system on popular aircraft like the Vulcan; in such circumstances we are unable to guarantee availability. Also for some aircraft admission we simply ask that people consider making a donation to museum funds for being allowed into the aircraft or helicopter. These donations are also going towards the aircraft restoration and repainting work that we undertake, plus museum development..